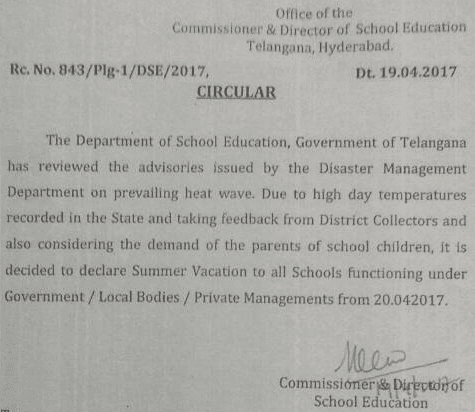 Summer Holidays to TS Schools from April 20th to June 11th, 2017: TS Govt is thinking to declare holidays due to heavy heat weather in Telangana. The Department of School Education, Government of Telangana has reviewed the advisories issued by the Disaster Management Department on Prevailing heat wave. Due to high day temperatures recorded in the State and taking feedback from District Collectors, and also considering the demand of the parents of school children, After, DSE may declare the holidays to all Schools functioning under Government/ Local Bodies / Private Managements and Summer Vacation may be rescheduled. Keeping in view of the scorching heat wave conditions and the rising mercury levels, the Telangana Government may decide to bring in some relief for the students by advancing the summer holidays. But, DSE Telangana has given clarification on Summer Holidays to TS Schools. Commissioner and Director of School Education has announced a press note for summer holidays. So, Summer holidays from April 20th - June 11th as usual and school reopens from June 12th. - Summer holidays from April 20th to June 11th. So, The Academic year 2017-2018 will commence with effect from 12.06.2017.